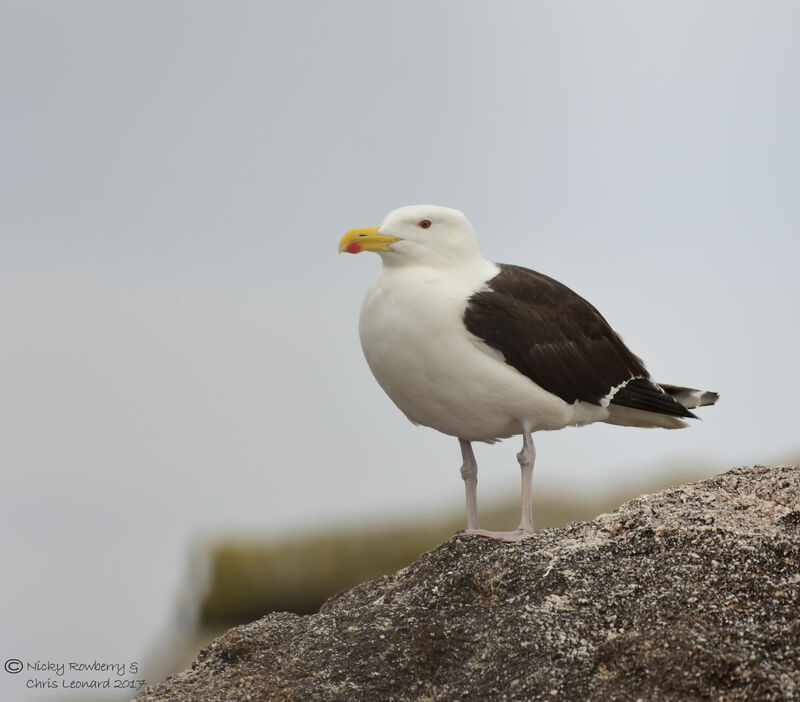 Next instalment on our recent trip to the Scilly Isles. 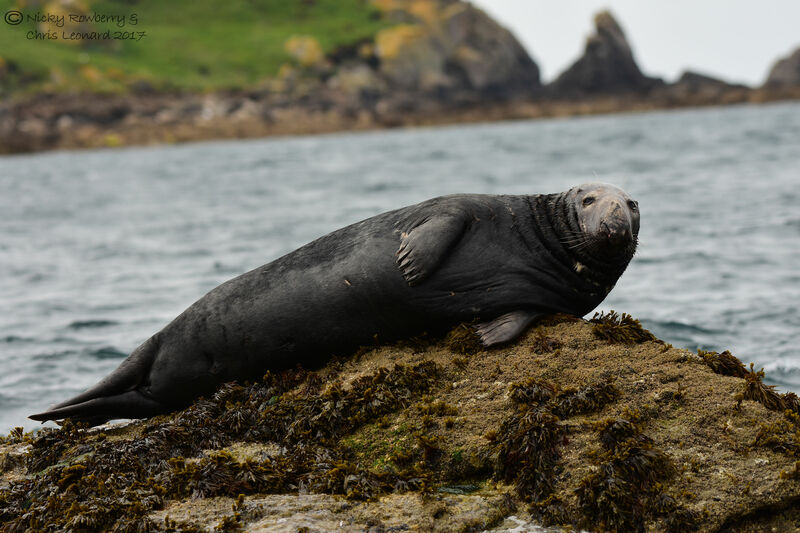 This time we were out on a glass bottom boat tour of the Eastern Isles – small uninhabited islands with unusual names like Little Arthur and Great Ganilly. 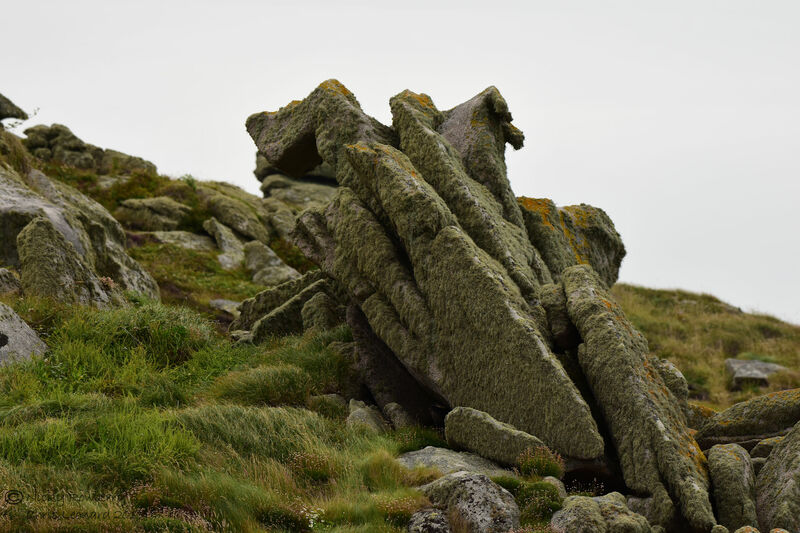 There were lots of interesting rock formations around, all covered with lichens, which provided sufficient interest until we got to the wildlife. As it turned out we didn’t actually see very much through the glass bottom (a few jellyfish and a lot of seaweed), but what we saw all around more than made up for it. 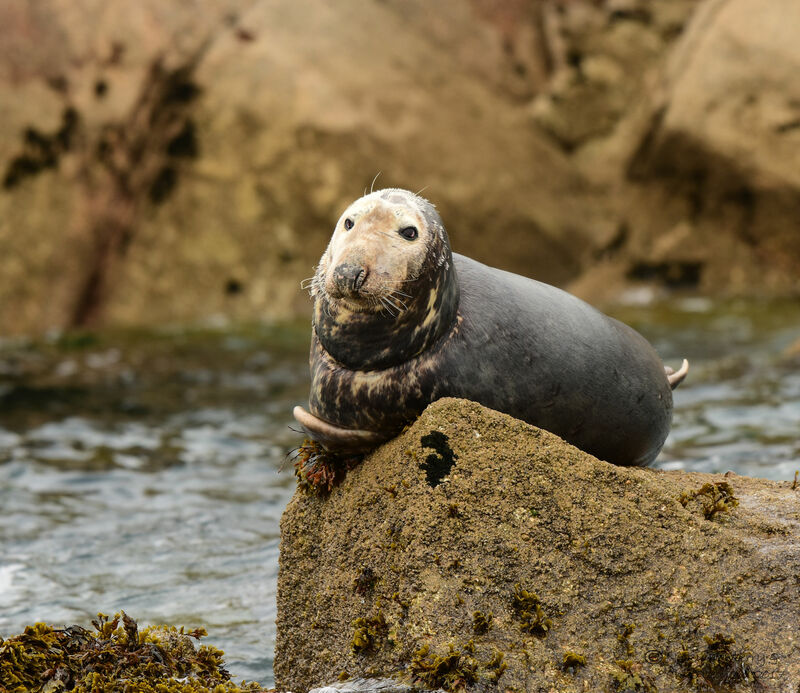 Most of our time was spent watching seals – Grey Seals to be precise. 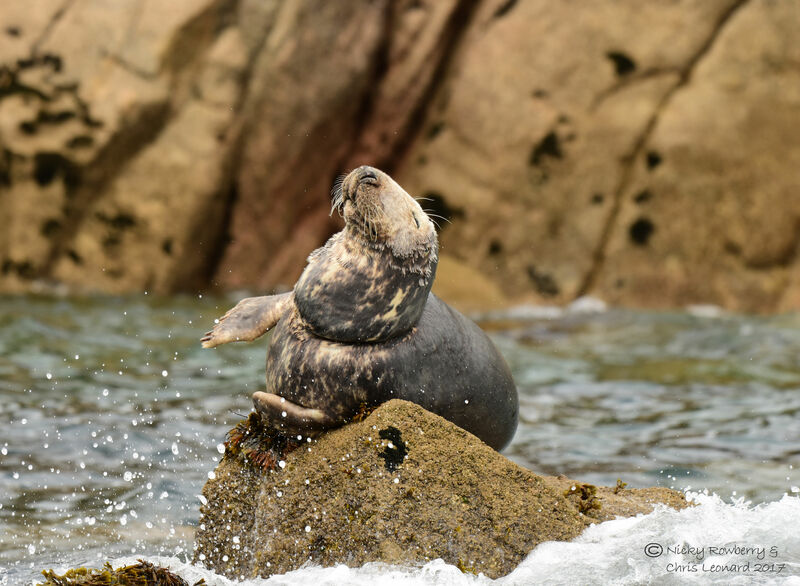 The Scilly Isles have a large and nationally important colony of grey seals and we were lucky enough to see quite a few on our trip. At first we just glimpsed them bobbing about in the water, watching us as much as we were watching them. But our guide (and skipper) soon spotted one hauled out on a rock. 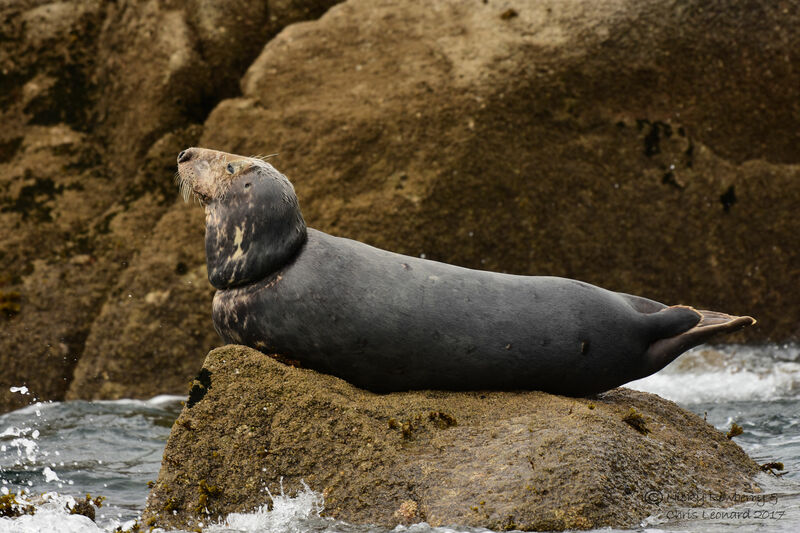 He identified it as a fully grown adult male grey seal. Unfortunately it seemed to have got something stuck around its neck – perhaps old fishing gear. It didn’t seem to be causing him any problems and hopefully as he was already an adult he won’t grow any more to cause it to tighten around his neck. Chris and I both took loads of photos – he seems to have got the knack of taking photos from a moving boat, I don’t and most of mine were very blurry. So most if not all of these photos are his! 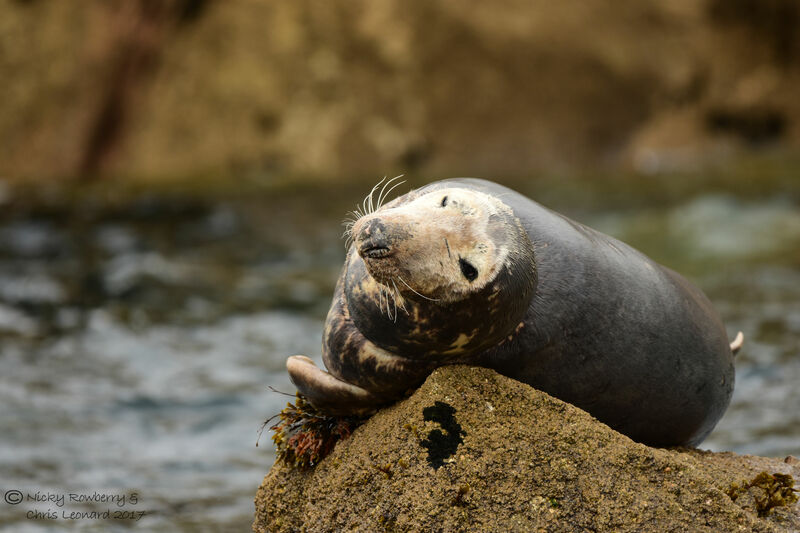 We continued round the various rocky outcrops that make up the Eastern Isles and eventually spotted another seal hauled out. All the seals seemed to be quite used to the boat and tourists and look unfazed by our visit. We had seen photos online of seals swimming under the boat so you could see them through the glass bottom. One of the reasons why we were maybe not lucky enough to see this was the presence of a group of snorkelers. 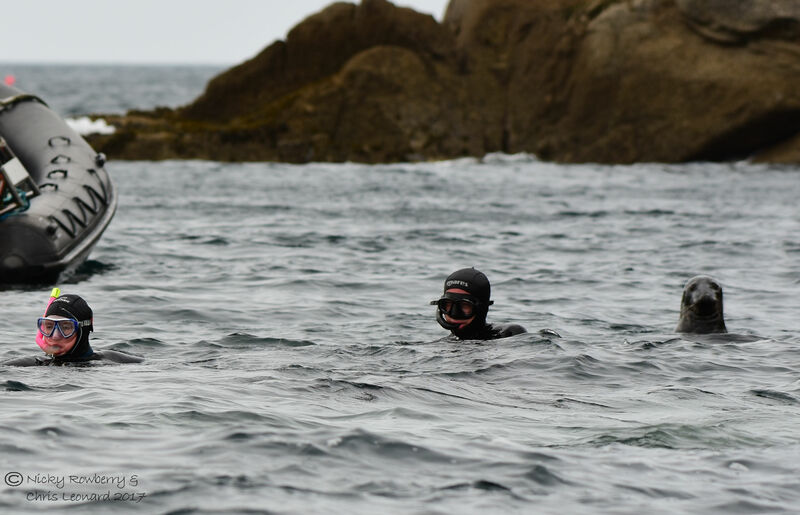 The snorkelers were also there to see the seals and the seals in turn were much more interested in the people in the water than coming over to our boat. They were swimming all around the snorkelers – spot the odd one out in the photo below! 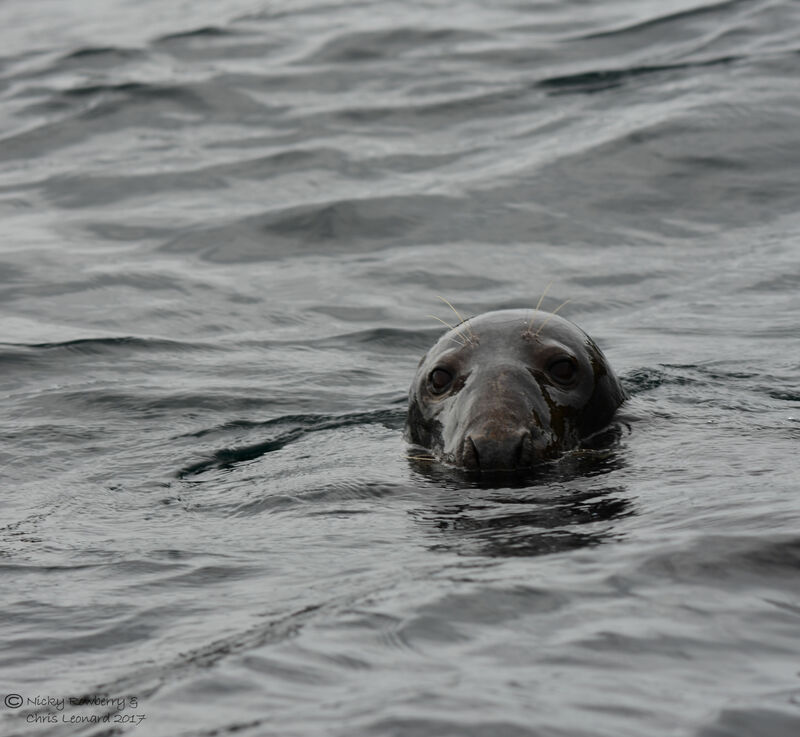 Maybe next time we go to Scilly we could try the snorkelling thing ourselves – it must be amazing to swim with them and they clearly weren’t bothered, just curious. 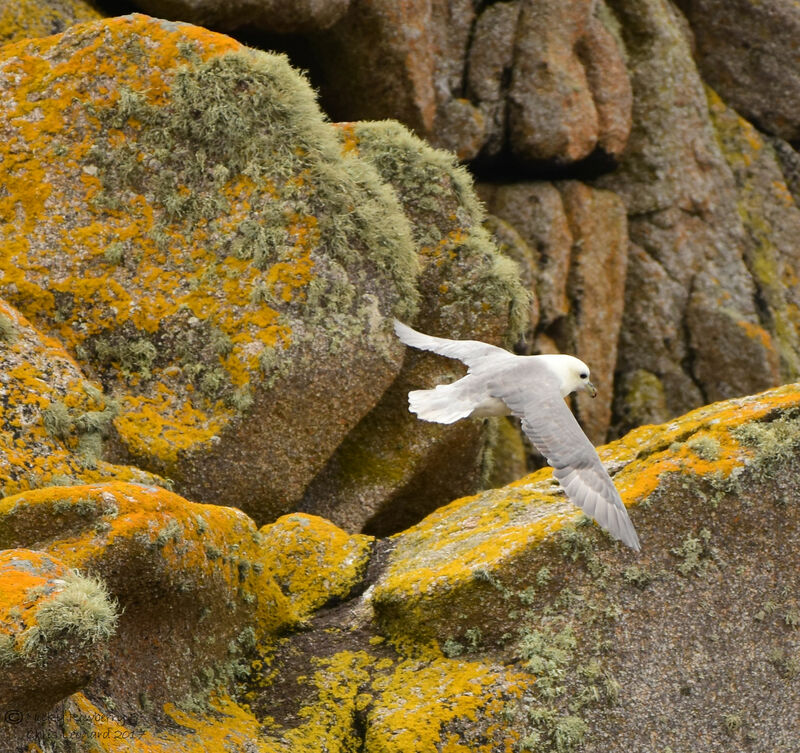 As you’d expect of a boat tour around any part of the Scilly Isles – seabirds were abundant. 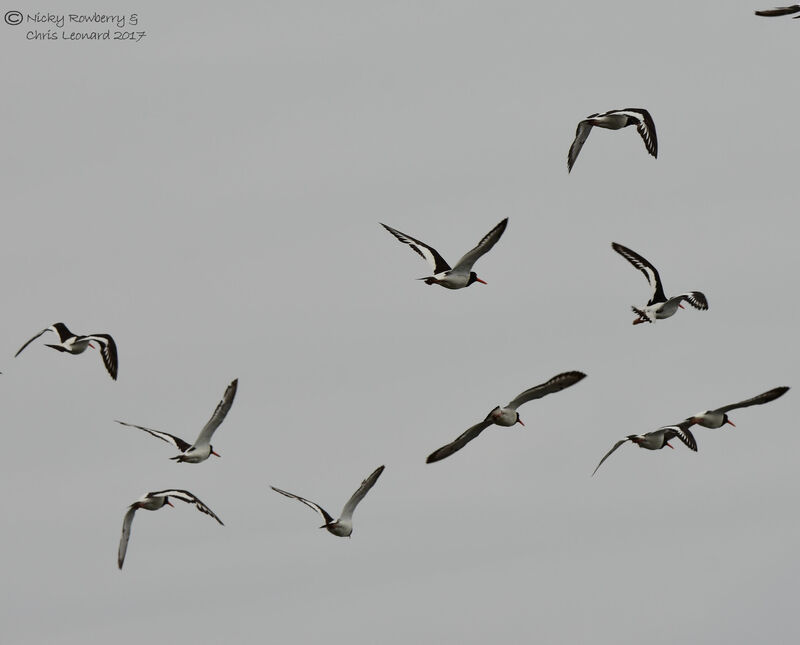 Fairly early on a flock of oystercatchers took off over the boat. Not easy to get decent photos of moving birds from a moving boat! We got one of our few sightings of Fulmars while on this trip, beautiful birds albeit with slightly odd looking beaks. While we were there, one of these gulls caught and killed a shag. 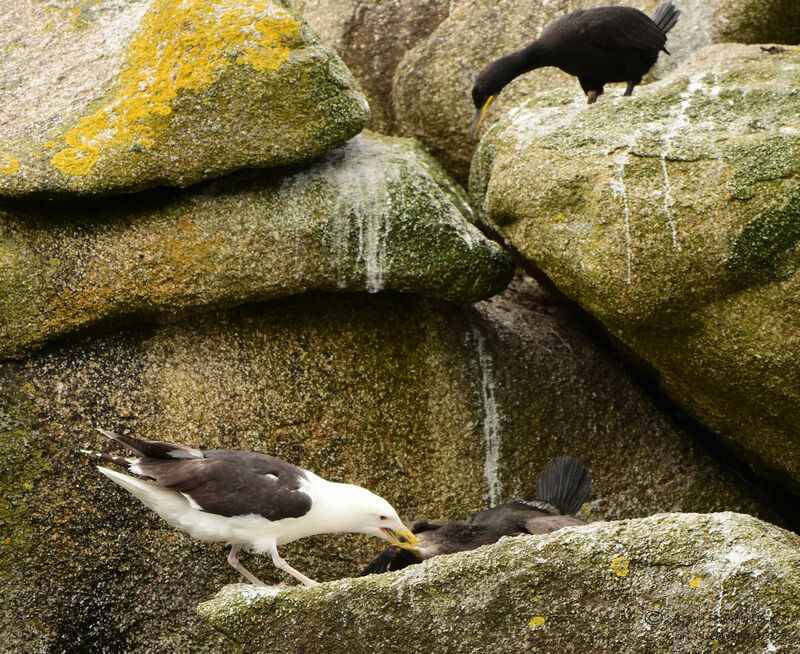 Chris managed to get a photo of the gull with its victim and another shag looking on (hope it wasn’t his or her mate). The gulls of course have to eat too, so although it was a bit sad to witness, it is all part and parcel of life. The unfortunate final outcome though was that the gull then managed to drop the dead shag down amongst the rocks, where it didn’t seem to be able to reach it. So the poor thing died for nothing – although I suppose something else probably ate it in the end. 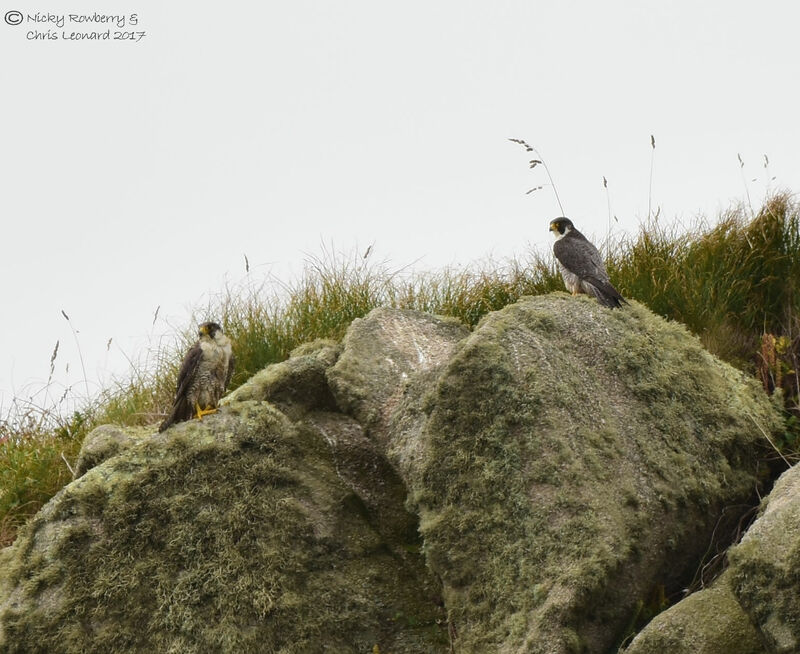 The biggest surprise of this boat trip came in the shape of birds I’d never associated with the sea – Peregrine Falcons! Our guide mentioned that there was a pair nesting with chicks on one of the islands, but we hadn’t really expected to see them. But sure enough they were there. We couldn’t get a proper look at the adults but the two chicks were clearly visible sitting on rocks waiting for the next feed. They were quite high up and we couldn’t get very close, but it was still lovely to see. Loving all your Scilly Isles posts. Must have been amazing to see all the wildlife, especially those you don’t get to see as much on the mainland.